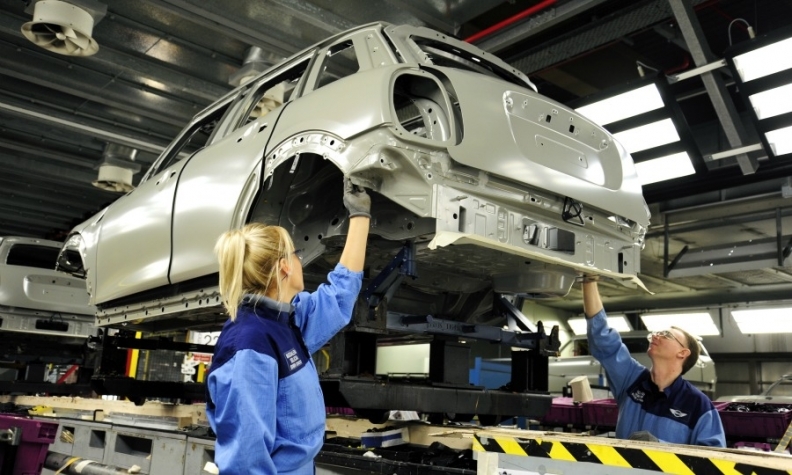 BMW Group is among automakers that build vehicles in the UK. Mini production is shown in Oxford. LONDON (Reuters) -- UK car production slipped 0.7 percent in October but output after 10 months is still at its highest since 2005. October production declined to 148,976 units last month compared with October 2014, the Society of Motor Manufacturers and Traders (SMMT) said today. Higher exports in October failed to offset a fall in domestic demand, with the number of models built for the domestic market dropping 8.3 percent, the industry body said in a statement. Exports, which account for around four in five cars built in the country, rose by 1.5 percent last month. Production through October rose by 2.8 percent to 1.32 million. "The industry has delivered a robust performance so far this year, particularly in terms of exports," SMMT CEO Mike Hawes said. "Given the slowdown we've seen in several key global markets in recent months, UK automotive manufacturing still remains in a strong position," he said. UK car sales fell by 1.1 percent in October, the first year-on-year decline after 43 months of growth. Nissan, Toyota, Honda, BMW Group's Mini and Rolls-Royce, Volkswagen's Bentley, as well as Tata's Jaguar Land Rover, are among the automakers that build cars in the UK.